We went out today for a little ride on Cleghorn Road. Had good fun! This entry was posted in Places and rides on December 8, 2014 by Rockhopper Doe. We went to Ensenada for one weekend, leaving on a Friday afternoon and returning on Sunday after lunch. I found that it was just about the right time to stay, if you’re the type of person that likes to pack your schedule. Make sure you have verification of US insurance and registration card. Before your trip, buy your Mexican insurance. You can do this at Baja Bound. It cost me around $55 to insure my bike for three full days and I paid it up front with my credit card. Make sure to print your verification of Mexican insurance and read what it covers. Pack your passport and make sure it is still valid. 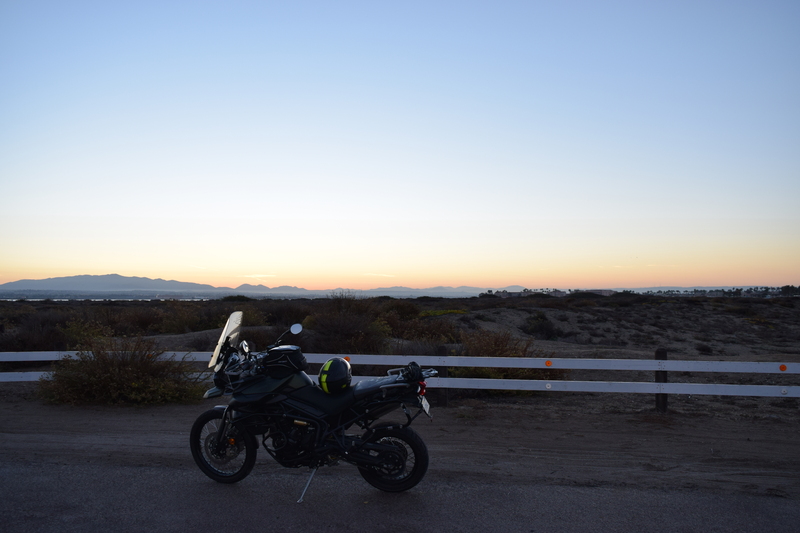 My Tiger 800 XC made it to the border on a single tank of gas (riding two up, fully loaded). Leaving from downtown LA, we’re looking at 145 miles. Fuel prices in Baja and LA are very similar. They might be a little higher in Mexico, but not significantly. You do not need a temporary vehicle import permit if you intend to stay in northern Baja California. If you will be going further into Mexico, you need to have one. 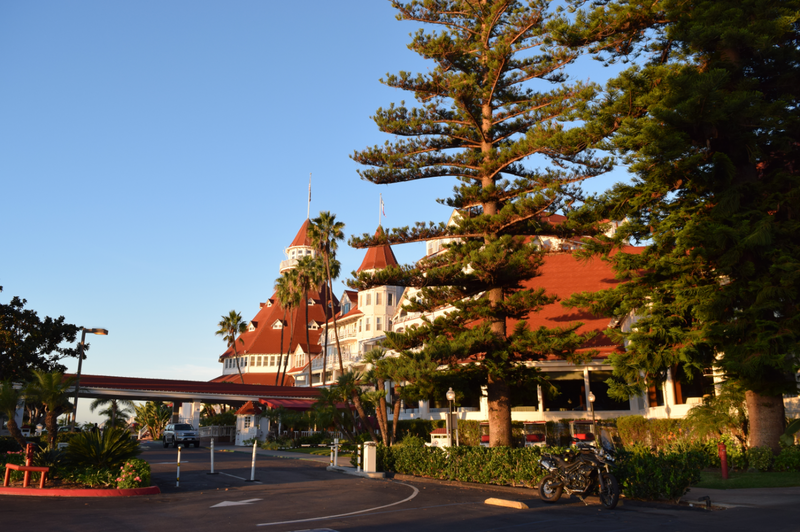 Stop by Hotel del Coronado. It is one of the first large buildings in the world that had wired electricity. The final electrical installation was inspected by Thomas Edison himself! It opened in 1888. Hotel del Coronado. A splendid structure. I liked riding the road that goes through Coronado. It was early in the morning, there was no traffic, and the breeze from the ocean was mighty fine. When you get on the Coronado Bridge (75), stay on the right lane to look at the view. You can’t stop, but you can go slow and enjoy it. Coronado has a stretch of road (75) that covers it from North to South. Crossing to Mexico is a very simple thing. We got there around 9 am and we were waived right through. No passports, no papers, no questions. Just move along! I didn’t even put my foot on the ground while there. However, be cautious as it might change with traffic loads or other factors. Personally, I don’t find Tijuana that attractive. We rode right through it. Baja has two roads that can take you to Ensenada: the new one (1D) and the old one (1). The new one has collapsed at the Salsipuedes Bay. Take the new road from Tijuana and you will be diverted where the 1D and 1 split (La Misión). Everything is clearly marked and you shouldn’t have trouble taking the detour. The detour will take you through 1 (the old road) and bring you out again where 1D and 1 meet, just outside of Ensenada. Do note that this road is one lane for each way, so traffic can get heavy if there are slow trucks. Be patient, enjoy the ride. Even with detours, 1D has two toll booths. We paid 30 pesos (USD 2.50) at the first one and 15 pesos (USD 1.50) at the second one. Remember, this is motorcycle pricing. Ensenada is quickly growing into a wine and food destination. While I personally think it is not there yet and there’s plenty of room for improvement, it is getting there. 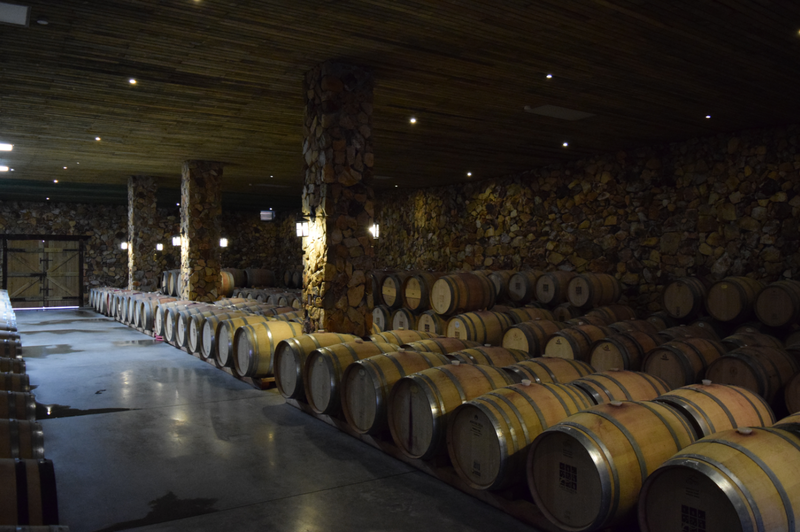 The Ensenada – Tecate road (3) is full of wine vineyards where you can taste it for a nominal fee. I highly recommend you find someone to drive because after the second or third visit, you’ll be buzzed. Wine is alright, but none of the ones I tried blew my head off, so I can’t recommend any of them. Visit Cuatro Cuatros, it has an amazing scenic view of the ocean and you can sit down in the afternoon to drink wine, eat fresh pizza, and enjoy the afternoon. They also have very nice safari tents where you can spend the night. Las Nubes was also a nice place to visit. Good view, nice wine. Make sure you swing by Hussongs. 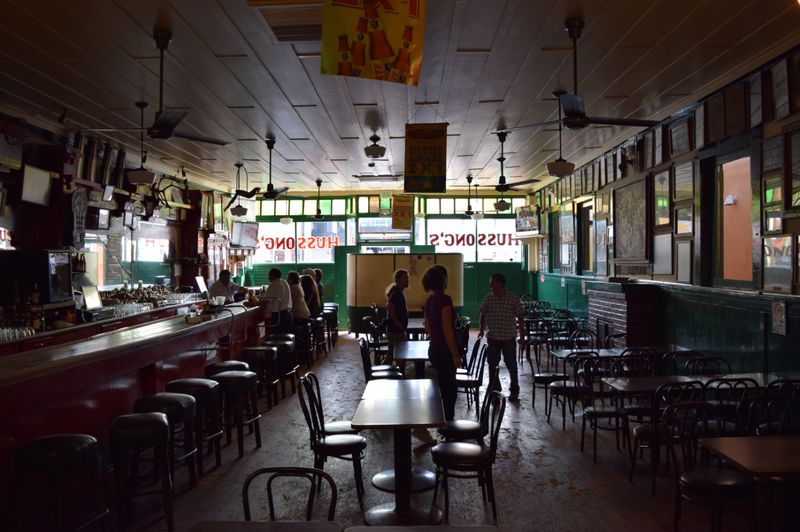 It is the oldest cantina/bar/pub in Baja California and one of the oldest in all of Mexico. The margarita was allegedly invented here. Lastly, make sure you visit La Guerrerense. It is a street cart with amazing seafood. And I do mean amazing. How many other street carts do you know that have a website? Even Anthony Bourdain made his way to this cart and Celia Carranza has the pictures to prove it! I tried a lot of things on the menu. Everything is good. If I had to pick one thing, I’d recommend anything with shrimp on it. Oh, and their peanut sauce is splendid and blends well with anything. Typical plate of La Guerrerense. 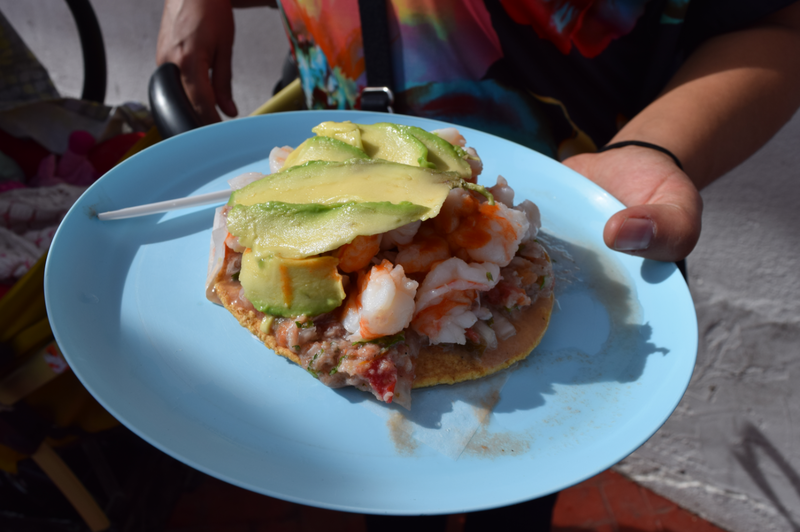 This is a shrimp tostada. Coming back into the US is a different ordeal. There are hundreds of cars waiting in line to cross back and the process is not very quick. Fortunately, motorcycles can lane split all the way to the front of the line, although there seems to be mixed opinions on this. If you’re coming in with panniers, be careful when splitting. It was impossible for me to split at some points due to very narrow spacing. If you somehow missed the Fastlane entrance (I did), you can merge into it since it is divided by concrete slabs with enough spacing for a motorcycle to ride through, but not for a car to do it. In this link, the Fastlane is to the right of all the cars waiting in the four lane street. A single gray car is seen passing through the Fastlane and the yellow concrete slabs are between it and the rest of the cars waiting. When you reach the immigration booth, you will have to present your passport and remove your helmet. There is an alternate border crossing at Tecate. I didn’t try it, but it is supposedly much quicker to pass than the Tijuana one. We hit some major traffic on highway 5 from the northern outskirts of San Diego all the way to Carlsbad and had to lanesplit for approximately 35 miles. This was on a Sunday at about 5 or 6 pm. This entry was posted in Places and rides on November 25, 2014 by Rockhopper Doe.